Supporters of the Deferred Action for Childhood Arrivals, or DACA chant slogans and hold signs while joining a Labor Day rally in downtown Los Angeles on Sept. 4, 2017. The United States is ending a program that shielded nearly 800,000 young undocumented immigrants from deportation and allowed them to work and study in the country. New applications, both for DACA status and work permits, will no longer be accepted starting Tuesday, according to administration officials. Trump approved the decision, but sent Attorney General Jeff Sessions before cameras to announce the controversial policy change. Sessions ended President Barack Obama's five-year-old administrative program that created the Deferred Action for Childhood Arrivals program with a terse statement: "DACA is being rescinded." Without the executive-level protection, Congress will have six months to act if it wants to continue to allow DACA recipients to remain in the United States. The program allowed young people, who typically entered the country as young children, mostly from Mexico and Central American nations, to work and study in the U.S. lawfully. DACA does not provide a path to citizenship or permanent legal residence, instead promises that recipients would not be priorities for deportation as long as they kept a clean criminal record. 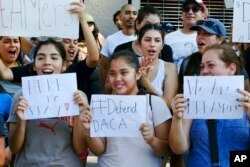 Although the president said in a written statement Tuesday that DACA recipients will not be priorities for deportation, and Homeland Security officials indicated in a press call that they would not actively pursue them, recipient Sarai Bravo told VOA in New York she is still worried about her future in the country. "This is the only country and the only place that I know is home, I'm not planning on leaving — unless I'm forced to. So, I'm going to continue fighting, coming with the rest of the community and encouraging people to come out and fight, and that is my plan. Trying to stay here forever," she said. Asked whether the White House would formalize in writing that DACA recipients would not be a deportation priority, spokesperson Sarah Huckabee Sanders said only that they are "not a targeted priority. … They weren't before, and they won't be now." Despite widespread approval in favor of letting the young people affected by the Obama order remain in the U.S., action by Congress is not certain. Lawmakers for years have been unsuccessful in substantially transforming U.S. immigration policies. During Obama's eight-year tenure in the White House, the Senate approved major policy changes only to see the legislation die in the House of Representatives. At protests around the country Tuesday, DACA supporters rallied against the administration's decision. In front of the White House, activist Gustavo Torres told the crowd: "This president lied to our community ... he told us 'I have a big hope for you dreamers.' He's a liar!" Trump came into office with a promise to eliminate DACA, but at times made statements that seemed to ease up on that rhetoric. Since his inauguration, however, the president has prioritized bolstering the country's deportation system, calling for thousands more immigration and border agents to be hired. In a statement issued after Sessions' announcement, Trump said he "does not favor punishing children, most of whom are adults, for the actions of their parents. But we must also recognize that we are a nation of opportunity because we are a nation of laws." Sessions, an immigration hard-liner who had pressed Trump to end the program, took no questions from reporters in announcing the end of protections against mass deportations. "We cannot admit everyone who wants to come here," Sessions told reporters. "All cannot be accepted." He added that limiting immigration "means we are properly enforcing our laws." Once current DACA status expires for current recipients, they could be subject to deportation proceedings if detained. The Homeland Security chief said that no current beneficiaries of the program would be affected before March 5, 2018, giving Congress a chance to act legislatively. DACA recipients whose permits expire before that date will be allowed to renew if they do so by Oct. 5, 2017. DHS officials said no other renewals would be acted on, and no one else will be allowed to apply after Tuesday. Supporters of the Deferred Action for Childhood Arrivals, or DACA, chant slogans and holds signs while joining a Labor Day rally in downtown Los Angeles on Sept. 4, 2017. Acting Homeland Security chief Elaine Duke explained earlier in the day that "the administration's decision to terminate DACA was not taken lightly." "The Department of Justice has carefully evaluated the program's constitutionality and determined it conflicts with our existing immigration laws," she said. Duke said that attorneys general in several states, including Texas, on the southern U.S. border with Mexico, had told Homeland Security officials that if Trump's administration did not move to end Obama's program by Tuesday, it would seek a court order to overturn the program. Conservative lawmakers and some Republican officials have long contended that Obama's order amounted to impermissible executive overreach. But in a statement Tuesday afternoon, former President Barack Obama skewered the Trump administration's decision. "To target these young people is wrong, because they have done nothing wrong. It is self-defeating because they want to start new businesses, staff our labs, serve in our military, and otherwise contribute to the country we love. And it is cruel," he said. "Let's be clear: The action taken today isn't required legally. It's a political decision, and a moral question. Whatever concerns or complaints Americans may have about immigration in general, we shouldn't threaten the future of this group of young people who are here through no fault of their own, who pose no threat, who are not taking away anything from the rest of us." VOA News Center reporter Ramon Taylor contributed to this report from New York.